Advertising Archaeology - Armstrong before World War II. In the United Kingdom ‘Hi-Fi’ probably reached its peak as a distinct mass-market consumer product during the period from the 1960s into the 1980s. I worked for one particular company, Armstrong Audio, during the late 1970s and early 1980s. When I joined them I had assumed they had begun making consumer electronics in the 1940s or 1950s. But two long-term employees – Ron Sheppard (G2FUF) and Ted Rule (G3FEW) – then told me that Armstrong has been started much earlier, around 1932. When I worked at their Warlters Rd factory I also did not realise that the company would cease trading in the early 1980s. And it was only much later that I started to feel that some record of their achievements needed to be collected and known. I have already researched and written elsewhere about Armstrong in the Hi-Fi era. Here I would like to try and survey their activity during the period from about 1932 up into 1939. i.e. from their early years up to the start of World War II. Sadly, the problem now is that the first decades of Armstrong’s activity are now essentially beyond first-hand living memory. And apart from what I now recall being told, a few audio tape recordings I made, and a manuscript by Ted Rule, there is no primary documentation of the company’s earliest years. Also there were no Hi-Fi magazines, during the 1930s-40s. Nor, indeed, have academic historians taken much interest in recording the history of this sector of UK industry. So there are no textbooks that really cover this topic in any detail. As a result here I will have to rely on a combination of personal hearsay and a process I’ve come to call ‘advertising archaeology’... The following is therefore mainly based on the advertising published in Wireless World (WW) and Practical Wireless (PW) magazines. The above shows the earliest three adverts I have (as yet!) been able to find. The first two were under “Radios for sale”, the third (22nd September) was under “Loudspeakers”. It is worth noting that even at this early point, more than one item/design was being offered. The adverts show that Armstrong’s factory was then at 100, Kings Rd, NW1. Many of the early adverts also mention ‘approval’. This referred to a policy of allowing people to order a chassis which was then sent to them to try out at their own home for a period before they decided if they wished to buy it. They could then either send the payment, or return the chassis as they preferred. In marketing terms, most manufacturers of the time either sold pre-built radios or radiograms as a consumer product, or supplied components to those who wanted to build their own electronics to get the best performance at the lowest cost. Armstrong instead aimed at a niche where buyers were happy to buy a good working set of electronics as a bare chassis. Indeed, some enthusiasts preferred to design and build their own cabinet and choose their own loudspeaker, etc, either to save money and/or to try and get what they felt were the best possible results. This approach proved quite popular with enthusiasts, and indeed, early issues of Hi-Fi magazines indicate it remained popular even into the 1950s and early 1960s when ‘chassis’ models were often sold or equipment could be purchased with or without a case. 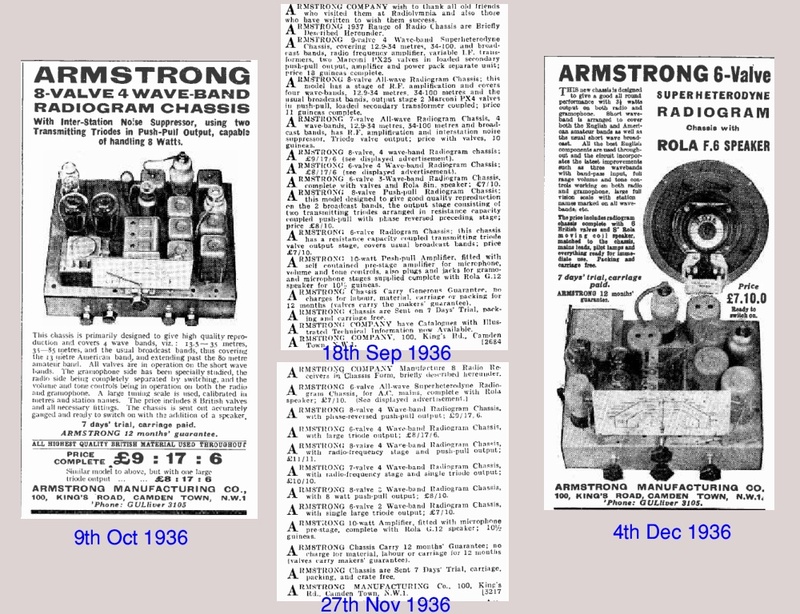 All of the earliest Armstrong adverts I have found are text-column ones in what might now be called the ‘small ads’ sections of the magazines. ‘Display’ advertisements with images of the equipment did not start to appear until later years. Also, none of the early chassis adverts listed any model ‘numbers’ or names. Again this practice was not adopted until later. Fig 2 above shows a couple of examples from the period Oct-Dec 1933. Most issues of Wireless World during this period carried similar adverts. The wordings and precise details varied and it isn’t always now clear how many different chassis designs were being offered at a given time. It was Armstrong’s practice in later years to operate on a declared basis of “continuous development”. i.e. even for a given model with a stated model name or number, the design would be routinely tweaked and improved. It may be that this approach was employed from the beginning, but we now have no direct evidence of this which I have been able to find. During 1934 the length of the text ads tended to increase, and more types of chassis model were described. By the end of the year ‘Radiogram’ chassis (i.e. units with a disc input) were being mentioned. The impression given is that the business was steadily growing. The adverts now also provided a telephone number, ‘Gulliver 3105’. Fig 4 - Selected Wireless World adverts from 1935. During 1935 the size of the text adverts appearing in Wireless World continued to increase, as did the number of different chassis on offer. In addition to the usual chassis information, two adverts provide some particular bits of information. 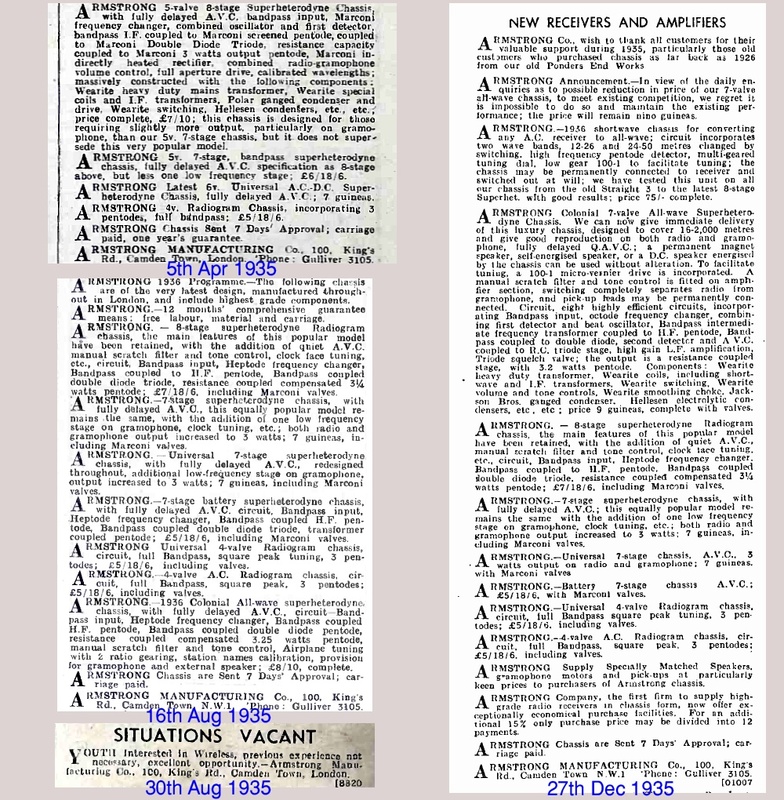 On the last advertising page of the issue dated 30th August 1935 an advert appeared in the ‘Situations Vacant’ section. “Youth interested in Wireless, previous experience not necessary, excellent opportunity - Armstrong Manufacturing Co. 100 Kings Rd, Camden Town, London.” It is possible that this is the advert that led to Ron joining the company. He then designed many of the sets they made during the following decade or more. 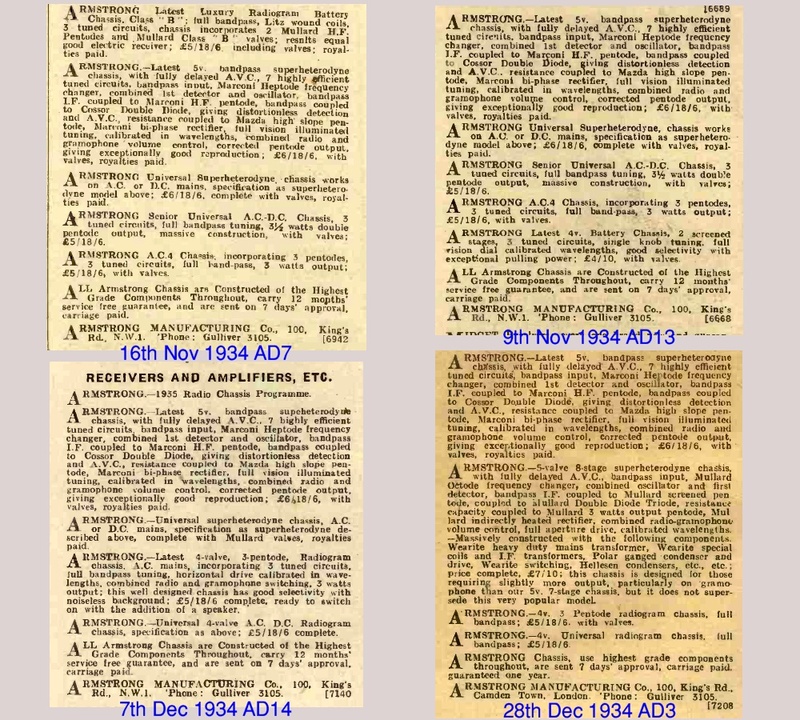 By December 1935 the text ads had become even longer and more detailed. It seems clear that their sales continued to expand. The 27th December example also contains: “Armstrong Co. wish to thank all their customers for their valuable support during 1935, particularly those old customers who purchased chassis as far back as 1926 from our old Ponders End Works.” Until I found and read this advert I had assumed that Armstrong had begun manufacturing in 1932 and that their first location was in Kings Rd. However this advert indicates that they actually began seven years earlier, at Ponders End! As yet, I have not been able to find any details of this earlier era, alas. The designation ‘colonial set’ indicates that by this time the company were making chassis suitable for use in locations with specific requirements – e.g. able to operate in hot, damp conditions from various types of electric power source. Their experience making radios for use in such locations may perhaps have played a part in their activities later on, during World War Two. During 1936 the text adverts printed in Wireless World gradually expanded and mentioned new models. 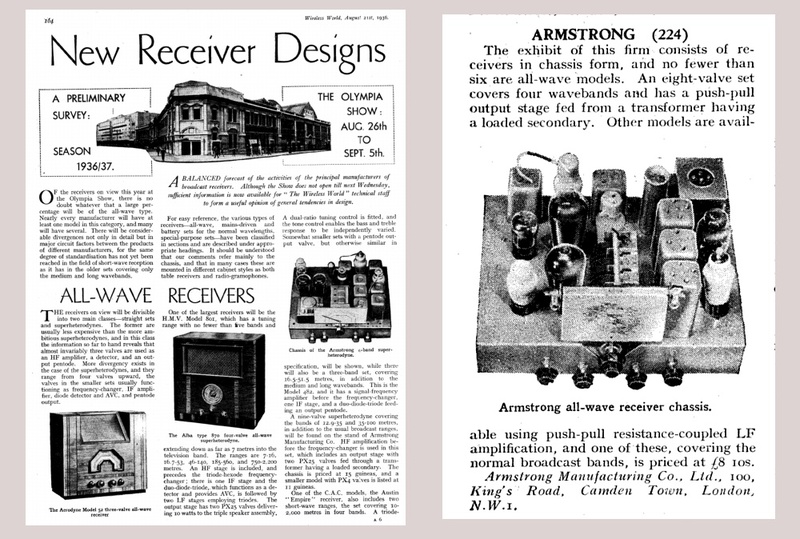 Examples of Armstrong chassis were also included in the “New Receiver Designs” feature for the Olympia Show in Wireless World. From the adverts, etc, it seems that around eight distinct models were being made and sold at the time. 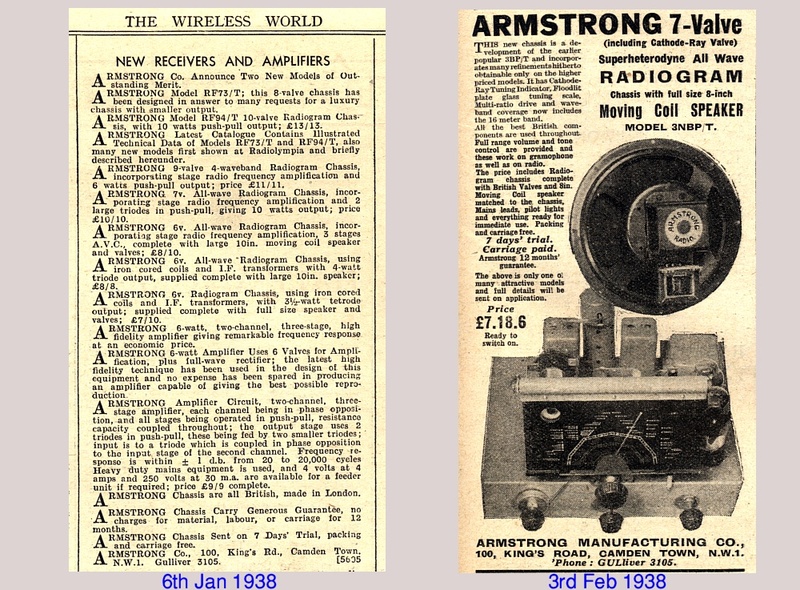 During 1936 Armstrong also began to insert display adverts into Wireless World. Here the term ‘display’ means the use of illustrations and/or graphic designs which departed from the basic text listings. The above shows two examples of such display adverts, along with two of text column format. The impression given was that the company could now afford to allocate a higher budget to advertising, and was selling more chassis. i.e. Growing more successful. The above illustration shows three items taken from Wireless World issues in Jan and Feb 1937. These indicate how the range of products Armstrong offered continued to expand. 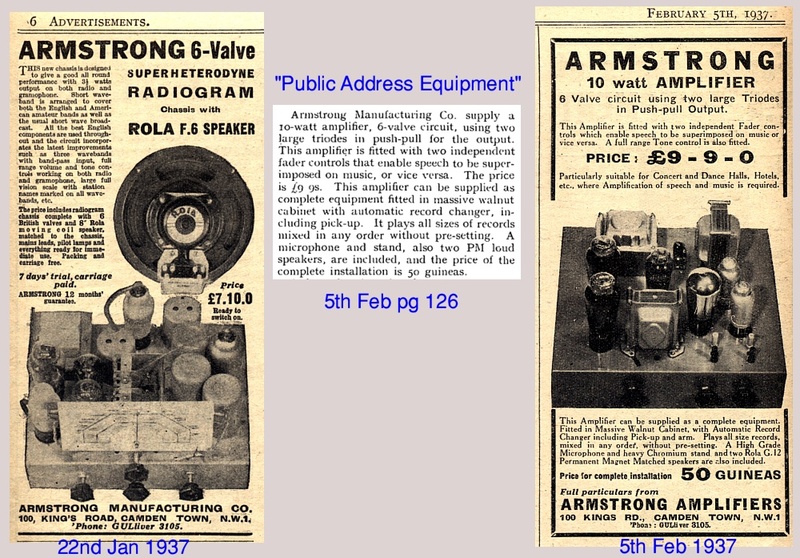 The Feb 5th issue of Wireless Word included the Armstrong 10 Watt amplifier system in an editorial article that listed various items of “Public Address Equipment”, and the details also appeared in a display advert in the magazine. In August 1937 information on Armstrong chassis appeared in Practical Wireless and Wireless World. The above shows items in their Olympia Show Guides. Page 208 of the August 27th Wireless World showed yet another chassis design and reported its details. By the beginning of 1938 Armstrong had began using model numbers to identify some of the types of chassis they sold. The text advert in the 6th Jan issue of Wireless World refer to the ‘new’ RF73/T and RF94/T models. The issue for 3rd Feb carried a display advert for the 3NBP/T which is said to have been developed from the “popular 3BP/T”. A slightly differently worded display advert for the 3NBP/T also appeared in the 5th Feb issue of Practical Wireless, and in later issues of that magazine. By the time of the Olympia Show of 1938 Armstrong had begun to advertise further chassis designated using model numbers. Figure 10 above shows some examples taken from issues of Wireless World. the full length display advert on the left comes from the 25th August issue and described the ‘new’ AW3PB. This offered “push button” tuning which had become fashionable that year as can be seen by the growth of the feature being offered by various makers at that year’s show. It also shows the AW125PP. The central part of Figure 10 illustrates Armstrong being mentioned in the Show Information published in the editorial text of the same issue. The image on the right shows another full-length display advert which lists the AW125PP, AW104PP, AW59, AW93PP, 3WT/PB, and AW3PB models. The pattern of model numbers seems to have been that ‘AW’ meant ‘All Wave’ – i.e. covering all the radio wavebands the enthusiastic listener would with to receive. ‘PP’ indicted a Push-Pull output for the amplifier section. ‘PB’ indicated push-button tuning. It can also be seen that during the second half of 1938 the address given for Armstrong changed slightly. It was now shown as “100 St Pancras Way (late King’s Rd) although the telephone number remained unchanged. Fig 11 - Jan-Jul 1939 The factory moves. During the first half of 1939 Armstrong established a new factory beside and above a shopping arcade in Holloway. The factory entrance was on Warlters Rd, London N7. This became their factory during the following decades. 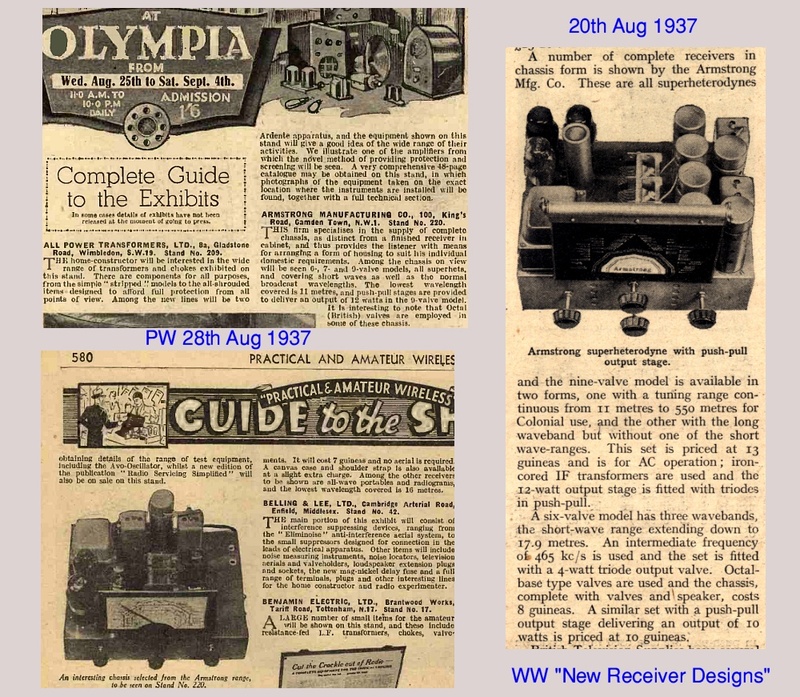 Figure 11 above shows some examples of their adverts in Wireless World during this period, selected to illustrated particular points, the most obvious being the announcement of the new factory. 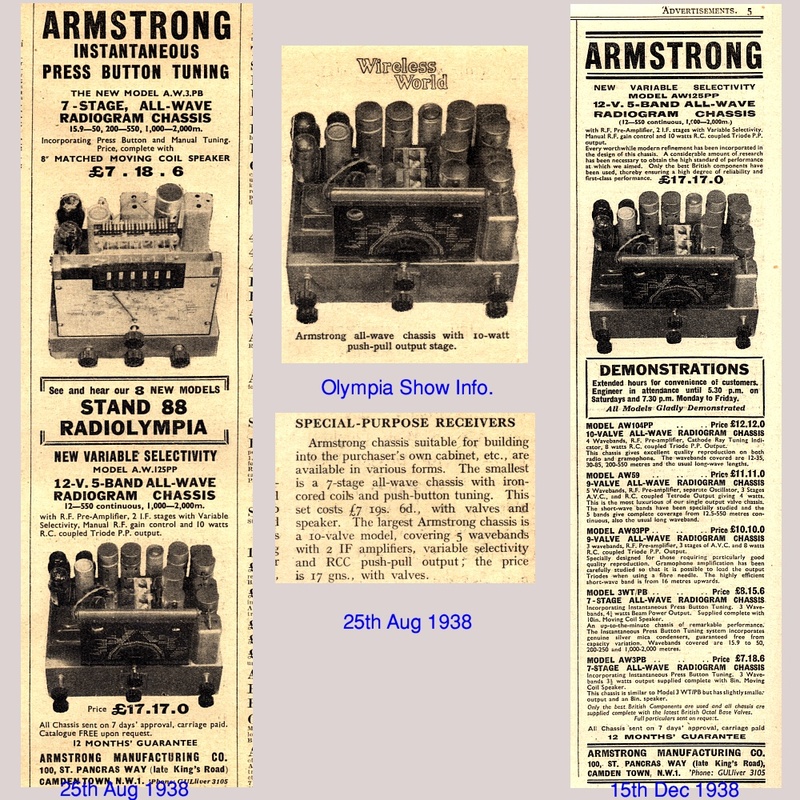 By this time the “London Radio Supply Company” had begun running their own display adverts featuring Armstrong equipment offered on “easy terms” – what would later on become known as hire-purchase. 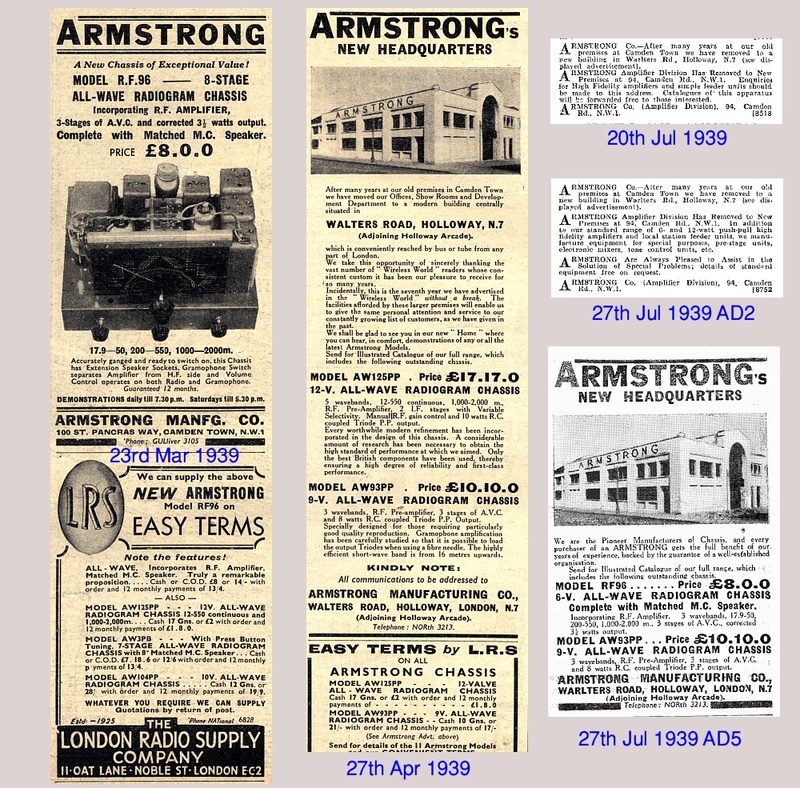 Armstrong also established their own public showroom on the ground floor of the Warlters Rd factory so that potential customers could come in and try the sets before deciding what they wished to purchase. Adverts also make mentions of “High Fidelity Amplifiers” and their “Amplifier Division” which indicates that their aim was beginning to explicitly encompass what these days we would regard as ‘‘Hi-Fi equipment” as well as the established “Quality” radio and radiogram chassis models. The wording of the adverts also shows that they had split their operation, with the Amplifier Division having been set up at 94 Camden Rd NW1 whilst the Warlters Rd factory was described as their “New Headquarters”. The adverts indicate the range of types of equipment being made. But do not show any sign of the way Armstong also often produced OEM items which might appear with other brand names on them, giving no external sign of who had designed and manufactured the electronics inside. For example, I was told that a number of hotels and shipping lines installed Armstrong chassis inside their own casework. Tracing when this occurred is, for historians, now a nightmare as such sets as might still exist would be almost impossible to identify. Hence the details of this aspect of Armstrong’s history is presumably now lost. Fig 12 - Wireless World Aug - Sep 1939 shadow of war. Armstrong’s SS10 chassis receiver was included in Wireless World’s Olympia Guide in the 24th August 1939 issue. This issue also carried a display advert for the SS10, SS2B, AW38, and AW125PP models. Up until this time the signs were that the company was expanding and the future looked excellent. However this was, of course, just before the outbreak of World War 2, which understandably caused a massive change in the situation and prospects. 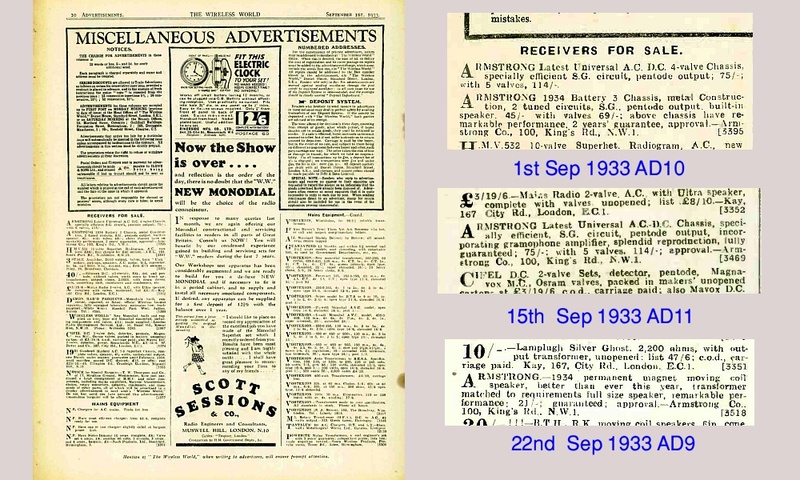 The first sign of the effect on Armstrong is the adverts which appeared in the months following August 1939. Figure 12 above shows (on the right) three early examples which signal changes that began to happen. The advert (top right) which appeared in the 14th September issue refers to “...suitable for receiving the North and Scottish Emergency Transmitters”. 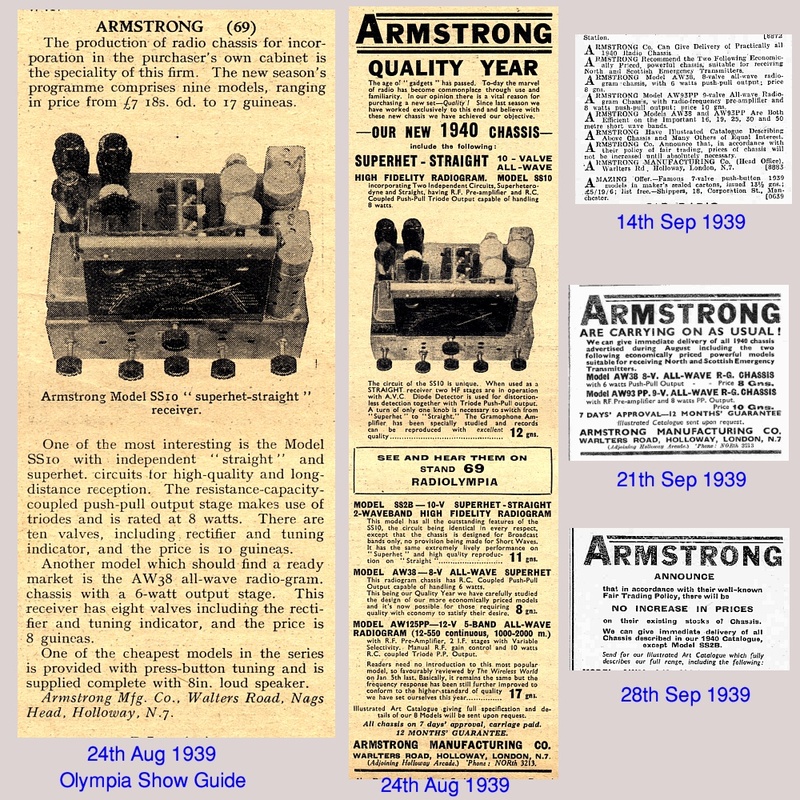 The 21st September advert stated that, “Armstrong are carrying on as usual!”, and the 28th September one, “No increase in prices”. Which indicate that there were concerns about what may be about to happen. By the time the war started Armstrong had grown into a fairly well established company with a lot of design and manufacturing experience in electronics, particularly regarding high performance radio receivers, including being able to operate in adverse environments. As a result, their work was in demand during the war, but the circumstances diverted this away from making and selling domestic sets to consumers. Given how things changed, and then developed after the war I will leave examining the period from 1940 onwards to a later survey. In this survey I have just selected a few of the many advertisements, etc, which appeared in Wireless World and Practical Wireless. These serve as being typical of the others. When possible I have been able to obtain scans of the original pages from either a copy I own, or one I located at the Museum of Communications (MoC) in Burntisland, Fife. (These scans are shown in colour in the above illustrations.) I would like to thank the MoC for allowing me to go though their issues. In other cases I found adverts in issues available from the AmericanRadioHistory (ARH) website. This is an extensive web-archive of freely available magazines and journals. A gold mine for researchers or interested amateurs. Again, I’d like to thank the ARH and its supporters for their work. Sadly, many of the early issues the ARH site holds have a lower level of detail than I could scan directly from paper originals. They are also often black and white. They therefore appear as such in the above examples. And in many cases issues of the magazines have been scanned omitting the pages of advertisements. This, of course, saves time for those doing the scanning. The omitted pages and limited resolution also keep down the resulting file sizes. I assume the presumption is that adverts don’t matter. But in the absence of other data, they can hold the only information we may now have to date or identify some things. For the above reasons, this survey is bound to be incomplete, but with luck I or someone else may be able to fill out missing details at some future point. The following websites provide some further information about Armstrong, its products, history, etc.